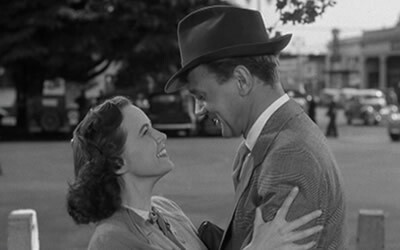 Teresa Wright and Joseph Cotten in Shadow of a Doubt, ’43. Actress Theresa Wright (1918-2005), gained unusual clout in the early stages of her distinguished career when she insisted on a most unusual clause in her 1941 contract with Samuel Goldwyn. Goldwyn, a talented, but hard-headed Hollywood producer, desperately wanted Wright under contract, and so he swallowed his pride and allowed Wright’s clause to stand. But he never forgave her effrontery and ended their relationship in 1948. Wright insisted on being normal. She was a serious actress, and a serious person. Muriel Teresa Wright knew who she was and never allowed herself to undergo a glamorous transformation like so many other young starlets—Ava Gardner, Lana Turner, Rita Hayworth—which led to stardom, but which, arguably, contributed to unhappy, unfulfilled personal lives.